Find out everything you need to know on the new Kia Ceed from independent vehicle review website Car And Driving. You can watch the video review to the left to see more of the car or read their written review below to get a true insight from an expert in the automotive industry. 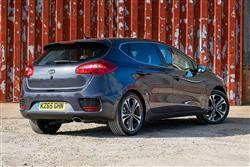 Kia fast tracks the latest version of its cee'd family hatch straight into contention. Jonathan Crouch reports on the 1.6 CRDi 134bhp diesel variant. The improved second generation Kia cee'd impresses with its more efficient engines, its improved quality indoors and the sheer array of high end features that are incorporated. It's no longer a cheap car but it remains a good choice if you're searching for value, especially in 1.6-litre diesel guise. The thing with being fast-tracked to the top of the tree is that things happen, well, fast. Where most manufacturers will replace a car when it's seven years old, Kia isn't playing that game. It can't if it needs to get where it wants to be, so it has cracked the whip and rolled out the improved second generation cee'd we're looking at here just three years after this design was originally introduced. The challenge facing Kia now is to launch a car that lives up to the expectations of the market. Not so long ago, there wasn't a great deal expected of the cee'd. We thought it was going to be a vehicle we would patronise, claim that it offered a lot of metal for the money and such like, but it was shockingly close to the class best. This improved second generation car will also have to be a lot better than merely cheap and cheerful. Let's try it in the form most British buyers will want, equipped with a 134bhp 1.6-litre CRDi diesel engine. This 1.6-litre CRDi powerplant comes with a six-speed manual gearbox but it also gives buyers the option of a 7-speed dual-clutch DCT automatic transmission, one of those clever gearboxes able to seamlessly select the next gear before you've even left the last one. For the improved version of this diesel variant, enhancements in refinement have been prioritised, so additional sound-absorbing materials have been adopted for the carpet and ventilation system, while twice as much anti-vibration foam has been added to the dashboard panel to cut engine vibrations intruding on the calm of the cabin. Otherwise, things are much as before. So the driving dynamics still won't satisfy those for who see handling response as everything, despite the addition of a torque vectoring system, which reduces understeer by partially applying the brake to the inner wheel under cornering. You still get a supple multi-link rear suspension system, something that's still not the norm in this segment. And there's neat FlexSteer steering that allows you to alter feedback at the helm. Plus these models are as rapid as most owners will need them to be, the 134bhp diesel 1.6 making sixty two mph from rest in 9.5s on the way to 117mph. Whether you choose to order this car in five-door hatchback, Sportswagon estate or pro_cee'd coupe guise, you should feel that in improved second generation form, it certainly looks more purposeful. At the front, it retains Kia's hallmark 'tiger-nose' grille, along with wraparound headlamps and integrated fog lamps. Changes include a more angular and wider bumper, with chrome trim around the fog lamps, and a smarter oval-shaped grille mesh echoing many of the shapes and design forms on the front of the car. A similar change has been made to the rear of the cee'd, with reshaped bumpers, sporty-looking reflectors and LED lamps all featuring. Inside, the fascia layout remains neat, though there are still rather a lot of buttons. The asymmetric, driver-focused dashboard looks classier now though, receiving flashes of chrome around the instrument binnacle, the air vents and around the upper edge of the instrument panel. The central fascia panel is now finished in a high quality, anti-scratch gloss black for a more premium look. Other chrome highlights have also been added to the cabin, in particular around the base of the gear-stick, on door handles, and to the temperature control dials on the dashboard, depending on trim level. There's also an optional colour pack to make the cabin feel more individual. Out back, as before, there's a 380-litre boot that's 20% bigger than that of a Ford Focus and 10% bigger than that of a Volkswagen Golf. That advantage is maintained when you push forward the split-folding rear bench to free up a useful 1,318-litres of total fresh air. Kia has made its name on offering keen value for money and that doesn't appear to have changed. What has changed is that the cars are no longer conspicuously cheap. Prices for this improved cee'd range start at around £15,000 and you'll be paying from around £17,000 for this 1.6-litre CRDi diesel. This reflects the fact that, in driving quality and capability up, Kia's costs have risen commensurately. In many ways that's an inevitability of climbing merging with the mainstream but the latest cee'd moves the game on in a number of ways. It starts bringing the sort of technology that was once the preserve of the premium brands to a more affordable price bracket. Yes, the likes of Ford and Vauxhall have been doing this as well, but Kia certainly doesn't shy away from some very high end features. There's a bright TFT high-definition instrument binnacle, dual-zone climate control, powered driver's seat adjustment with memory and a full length (1,045 mm long) powered panoramic glass sunroof. Depending on which trim you opt for, there's LED daytime running lights, fixed cornering lamps, and HID headlamps that turn the low beam to match curves in the road and enhance the driver's night vision. There's also the Parallel Park Assist System (PPAS) where the car uses its sensors to steer itself into a parking space. All you need to do is control the accelerator and brake. No car in this sector can afford to go to market with second-rate economy and emissions figures. Gone are the days when a low sticker price would more than mask the fact that the engines were a decade out of date, and if there's one thing that carbon dioxide-based taxation has done, it's driven manufacturers into a race to develop ever smarter and more efficient engines. Kia is no exception and the latest clutch of engines deliver respectable numbers. As with other Kia models in Europe, the cee'd is available with fuel-saving technologies developed under the company's EcoDynamics label. These measures, which are offered on both diesel and petrol models with manual transmission, include ISG (Start/Stop), low-rolling resistance tyres and an alternator management system (AMS). Some flesh on those bones? The 1.6-litre 134bhp diesel cee'd returns a combined cycle fuel consumption figure of 78.5mpg, while CO2 emissions start at just 94g/km. This comes courtesy of an ISG Start/Stop system. As for that 7 year or 100,000 mile warranty which, since it can be passed from owner to owner, should help the impressively strong residual values, it's worth pointing out the 'bumper to bumper' complete car warranty is only five years, with the extra two years of cover being restricted to the engine and gearbox. There's also a long 12 year bodywork warranty. The Kia cee'd is the perfect example of a car that's absolutely right for its time, especially in the 1.6-litre CRDi diesel guise we've been looking at here. All the planets have aligned and delivered a vehicle that does the right thing at just the right time. Global economics have played to its advantage, but one can't help but feel that even without an enforced age of austerity, this car would have succeeded through its sheer depth of engineering. Kia is not a company that is easily contented with its position, but in striving to improve its wares, it risks being subsumed into the morass of the middle market. That time is not quite yet and the cee'd is still the car to choose if value is a key driver in the buying decision. Get a bit excitable with some of the options and it's possible to build yourself quite a pricey car and it's worth realising that the used market isn't quite ready for that just yet, so step carefully. Choose the right car with the right engine and it's hard to get things too badly wrong. It's still a Reasonably Priced Car. The producers at Top Gear will need to look elsewhere for something appealingly inept though.